IMPROV kitchen: summa summa summer time! I've been bad, really bad. I't's been almost a month since I posted, I'm very sorry! With vacations and friends in town I found myself so busy. If I told you I had the most amazing 3 weeks would you be able to forgive me? Because I did. My cousin got married in Tahoe and I was able to spend an entire week in a cabin with 25 family members. It was a mad house of amazingness! I got back and the very next day two of my favorite people came to Chicago for a 5 day visit. It's been a welcome but busy Summer so far! For me, nothing says Summer like corn on the cob and watermelon. I don't even like watermelon but for some reason it warms my soul. It's one of those foods that shows up for a few short months but leaves memories for a lifetime. Corny? I know... but it's so true! I LOVE Summer! 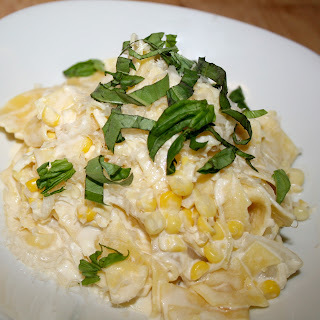 Lately I've been making this fabulous Summer Corn Pasta. I can't get enough. I've made it 3 times in the past month. Considering I've been gone for a good part of that month I think it says something about the dish. 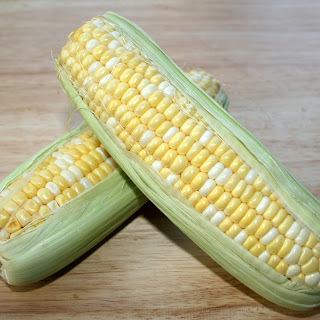 It's not too heavy, its both sweet and savory, has lots of fresh Summer corn and hits the spot every time. I highly recommend it! Get a large pot of water on the stove and set the burner to high. 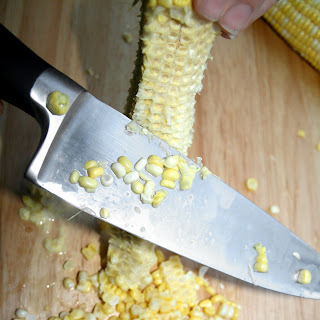 In the meantime, cut the kernels off the corn. Once you've finished, don't discard the cob! There's a lot of great starches in there that will help flavor and thicken the sauce! 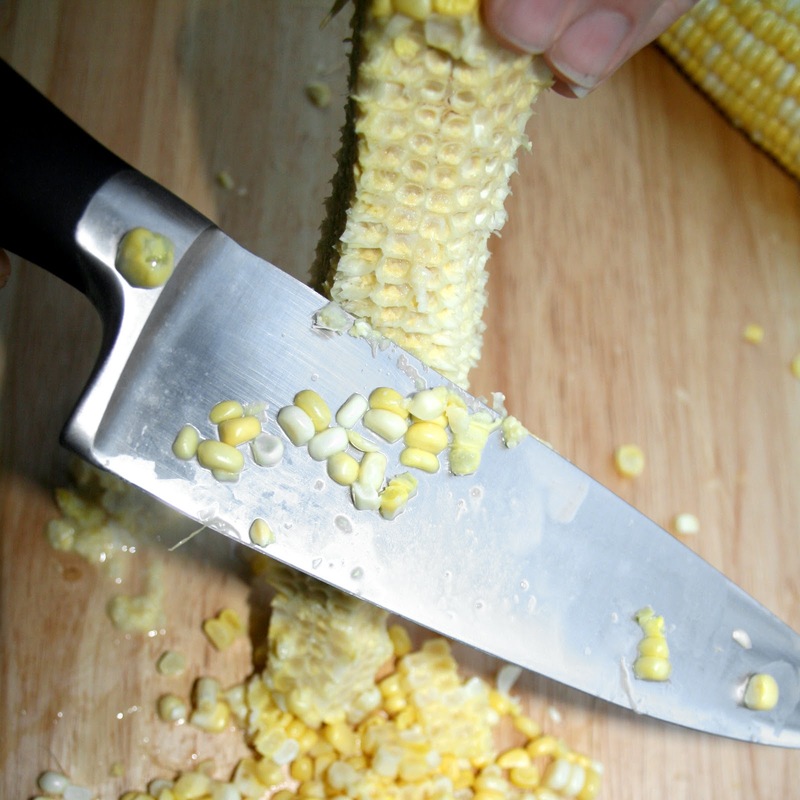 With the back of a knife, firmly press down the spine of the cob to extract the pulpy juices. 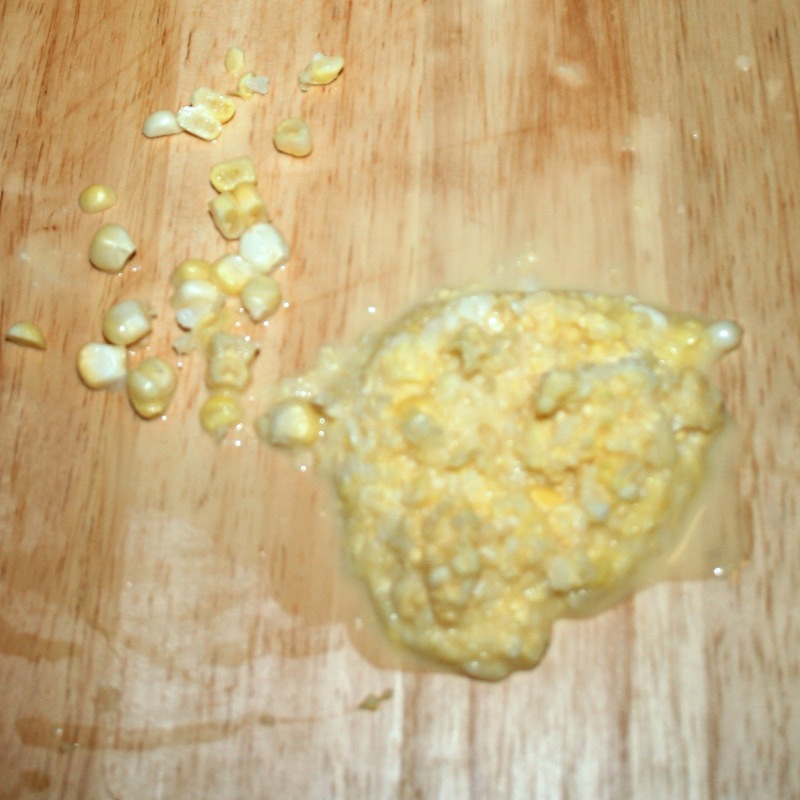 Reserve the pulp from both cobs and set aside. Next, slice your onion in half and thinly slice it. You can chop it if you prefer but I really like the way the slices look. In a skillet, melt your butter or oil. Then add in your onions. You don't want to caramelize them, just cook them until they start to get transparent. When that happens, add in your corn kernels and cook for another minute. Add cognac and corn pulp to the pan and let cook for an additional minute (until some of the cognac cooks off). Add in your mascarpone cheese and stir until it's melted and incorporated with the other ingredients. Once this happens put your pasta in the water and cook until al dente (a little bit of a chewy bite to it). Transfer pasta right from the pot to the pan. It's ok if some of the water gets into the sauce. You're going to add more pasta water anyway. Once pasta is in the pan give it a few good stirs or tosses with tongs. Add in little by little the pasta water. You want it to be a rich, thick sauce but not gloppy. The starches from the corn and from the pasta water will help thin out the mixture but keep it rich and thick at the same time. Finally, add the parmesan cheese and salt + pepper to taste. Garnish with basil and more parmesan cheese if you like. Also, if the sauce starts to thicken up too much, just keep adding more pasta water until it reaches the consistency you prefer. if you don't have fresh corn, you can definitely use thawed frozen corn. you won't get the corn pulp but the sauce will still turn out just fine. you can use shallots or yellow onions if you don't have sweet onions. Even red onion would be pretty in this! as always, you can leave the booze out. i think cognac brings out the sweet flavor of the corn! also, use your favorite pasta type. no need to go out and buy a special type, any will do!